Dave Query, known as DQ around town, is a hometown guy. Having grown up in Boulder, he left, went to the Culinary Institute of America, walked through France, worked all through the U.S., returned and became part owner of his first restaurant in 1989. 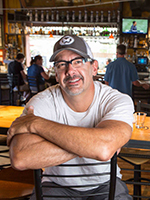 He now owns and operates the Big Red F Restaurant Group which has 12 restaurants — five of which are in Boulder County. Dave and his crews at the restaurants are most proud of their contributions to the community and of the trust they’ve earned from the fine people of Boulder, the greatest city in America. Yeeee-HAW! Wake up early. Have breakfast at Village Coffee Shop. Get some juice at Wonder to take on a hike, a bike ride or to go fly fishing up Boulder Canyon. If you don’t have a bike, rent one from my buddy Doug at University Bicycles (the greatest bike shop in America). Ride up the Boulder Creek Path, fishing for brookies and brownies. Come back down and go see Danny at Mustard&apos;s Last Stand for the greatest Chicago Dog this side of Wrigley (ketchup, mustard, onions, pickles, relish, tomatoes, (no kraut or peppers), fries and a root beer. Get up feeling great and hit the rooftop of West End Tavern for a refreshing bourbon cocktail from their expertly prepared list and some dank BBQ from the smoker. Stop by Jax Fish House next for a dozen oysters at the bar. Then slide down the block to Centro for a margarita and some killer tacos at Boulder’s best people-watching patio bar. Walk the Pearl Street Mall and check out all there is to see. Make one last stop for a leisurely nightcap at The Bitter Bar. Best adult cocktails anywhere. Good day. Good day, indeed.